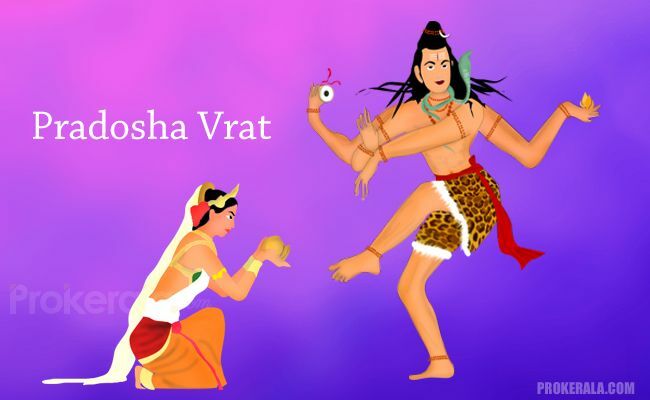 The Pradosh vrat is a popular Hindu vrat that is dedicated to Lord Shiva and Goddess Parvati. The Pradosha vrat or Pradosham is observed twice in the lunar month as per the Hindu calendar. This fast is observed on the Trayodashi (13th day) of both the Krishna Paksha (Amavasya) and Shukla Paksha (Poornima). The work ‘pradosh’ in Hindi means the dusk of the evening tide or early night. As this sacred vrat is observed during the ‘Sandhyakaal’ that is the evening twilight, it is called as the Pradosh vrat. According to the Hindu mythology it is believed that on the auspicious day of Pradosham, Lord Shiva together with Goddess Parvati feels extremely delighted, pleased and generous. Therefore the followers of Lord Shiva keep a fast and worship their deity on this chosen day to seek divine blessings. The Pradosh vrat can be observed by all irrespective of the age and gender. People in different parts of the country observe this vrat with full devotion and dedication. The Pradosh Vrat is observer in honour of Lord Shiva and Devi Parvati. In some parts of India, the disciples worship the Nataraj form of Lord Shiva on this day. As per the Skanda Puran there are two different methods of fasting on the Pradosh vrat. in the first method, the devotes observe strict fast for whole day and night, that is, 24 hours and which also includes keeping a vigil at night. In the second method the fasting is observed from the sunrise until sunset, and the fast is broken after worshipping Lord Shiva in the evening. By following these simple rituals with utmost sincerity and purity, the devotees can easily please Lord Shiva and Goddess Parvati and seek their blessings. The benefits of the Pradosha vrat are explicitly mentioned in the Skanda Purana. It is said that one who observes this revered fast with devotion and faith is bound to possess contentment, wealth and good health. This vratham is also observed for spiritual upliftment and fulfilment of one’s desires. The Pradosha vrat has been greatly lauded by the Hindu scriptures and is held very sacred for the followers of Lord Shiva. It is a known fact that even a single glance of the deity on this propitious day will end all your sins and bestow you with bountiful blessings and good fortune. Som Pradosha Vrat: It falls on a Monday and hence it is called as ‘Som Pradosha’. By observing the vrat on this day, the devotees will become a positive thinker and all their desires will come true. Bhaum Pradosha Vrat: When the Pradosham falls on a Tuesday it is called as ‘Bhaum Pradosh’. The devotees will get cure from their health problems and also improve their physical health. The Bhaum Pradosh vrat also brings prosperity. Saumya Vaara Pradosha Vrat: The Saumya Vaara Pradosha falls on a Wednesday. The devotees on this auspicious day seek fulfilment of their wished and are also blessed with knowledge and wisdom. Guruvaara Pradosha Vrat: It falls on a Thursday and by observing this fast, the devotees are able to put an end to all their existing dangers. Furthermore the Guruvaara Pradosha Vrat also invokes blessings from the Pitru or the ancestors. Bhrigu Vaara Pradosha Vrat: When the Pradosha vrat is observed on a Friday, it is called as the ‘Bhrigu Vaara Pradosha vrat’. This vrat will bring you all the contentment and success by eliminating the negativities from your life. Shani Pradosha Vrat: The Shani Pradosha falls on a Saturday is considered to be very important of all the Pradosha vrats. The individual who observes the vrat on this day will be able to revive his lost wealth and also seek promotion. Bhaanu Vaara Pradosha Vrat: It falls on a Sunday and the benefit of Bhaanu Vaara Pradosha Vrat is that the devotees will attain longevity and peace by observing the fast on this day.